A clean grill means better tasting (and safer) food and longer grill life. 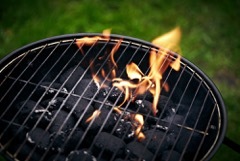 Here are four simple steps to help you keep your outdoor grill clean. When you’ve removed food from your grill grates, leave the heat on for 5-10 minutes to burn off excess grease and food bits. Scrape lightly with a long handled grill brush or a clean, crumpled piece of aluminum foil. Turn off heat the heat and scrape again if any extra ash needs to be cleaned off. Dirt, grime and grease get on the outside of your grill too. Use a mild household cleaner or a few drops of dish soap in warm water to clean the outside of your cool grill. Be sure to dry it with a cloth to help prevent premature rusting. Keep your grill covered when not in use. When the grill is cool, check under the grill for the grill pan or food trap. Disconnect periodically, toss whatever food bits it contains and clean with soapy water to help reduce the chance of a grease fire. Depending on how often you use your grill (but definitely at least once or twice per year), deep clean the grates. Remove the grate(s) from a cool grill and dip into a bucket of soapy water. Scrub with a grill brush. Rinse in clean water, wipe the grates dry and place them back onto the grill. Clean grilling is delicious grilling. Happy (clean) grilling from your friends at No Name Premium Meats and Seafood!